Onyx and other students feel that the school has not been transparent with them as it has been in the closing process. PORTLAND, Ore. — The Oregon College of Art and Craft has been a Portland institution for 112 years providing a place for students to study as well as community classes and programs. It will be closing this year. Some students at the college will have to transfer at the end of its last semester in May of 2019. Onyx Andra said OCAC was their first choice “I no longer get to graduate from the school I paid for four years to attend, I no longer get to get my bachelor’s in craft,” they said. 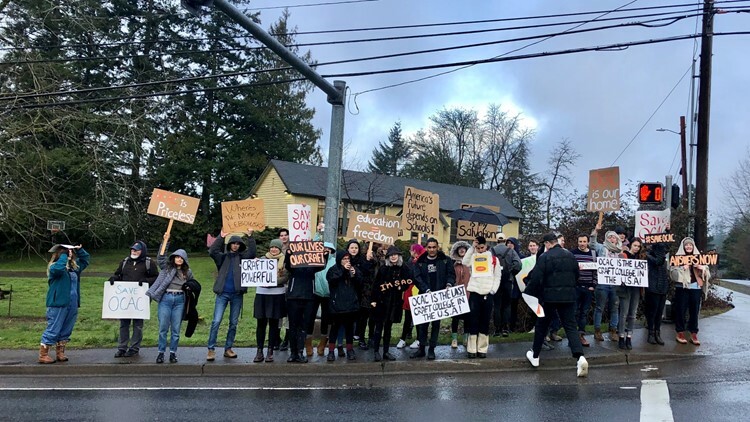 Portland Northwest College of Art is working with students, according to Onyx and they will be able to transfer with their credits there, but they say that is not the point. Students who have spoken with administration directly say answers are in short supply. Tess Beauchamp-Rheault is an alumna of OCAC and believes Portland is a place that respects and relies on craftspeople. “Our goals moving forward are to really accentuate craft and the craft community. We are hoping to keep organized and keep moving forward and show how valuable craft is nationwide,” she said. Craft is not just glitter and poster board, according to Beauchamp-Rheault but art and products made with intention and love. Understanding the why behind making the effort put into the process is what distinguishes Craft, which you can get a degree in, and craft like Elmer's glue projects and hobbies. There is also a FAQ section where students, staff, and community members can read about what the closure means for them. As it stands, there is a list of places students can take their credits, including PNAC. But for a lot of students, losing the school means more than the potential of losing credits. Thea Kinner will be graduating from OCAC this semester but has been attending the center for some 9 years taking classes and attending community events. “There was sort of this feeling of impending doom with all of the talk of mergers,” said Kinner. “We still are not sure if the community programs are going to be saved.” And that doesn’t seem to be clear at this point either. But you can stay up to date on that information on the OCAC’s website. The decision by the board is final, an administrative worker tells KGW. With the decision set in stone, all the school can do is make information available on their website and through communication channels to ensure a smooth transition for all.